This is a review of Priorin made by Bayer. Priorin is a liquid formula that is used to prevent or stall hair loss. It effectively slows down the aging process by promoting good circulation to the root of the hair which helps to strengthen the hair root. Read on to find out how this formula can delay the aging process of hair so hair will remain healthier longer. Melatonin- This is a very strong antioxidant. Several studies have evaluated its effectiveness on hair roots. Melatonin fights thinning of hair and hair loss by stimulating hair growth. Wheat germ oil- This oil is also known as Vitamin B7. Its duty is to help normal cell growth and function. It aids in the growth of skin cells and plays a major role in the formation and growth of hair and skin. Ginkgo Biloba- This is an herbal extract that has different effects on circulation of blood to the brain. It is also an extremely strong antioxidant which helps to protect the hair. It is recommended to use one vial per day. The formula comes in individual applications. After you have brushed your hair to remove any hair spray or gel, apply this directly to the scalp when your hair is dry. Slowly apply the product to the top of your head and the formula will spread when it comes in contact with the dry scalp and feel cool. Try to keep your head tilted back so you don’t get any of the liquid in your eyes. Once the vial is empty, gently massage the formula into your scalp. It is suggested you use this formula daily for at least 3 months. The website did not list any side effect to the use of this formula. The only thing that was stated was that it was recommended to not use this formula if there was a scalp or hair ailment present. The website itself doesn’t sell any of the products but you can purchase them from Amazon and Ebay. The prices range from $33.50 to $48.50 for 20 vials. If you search the internet, there are various websites that offer the product at discounted prices. The website did not offer any information on whether there is a guarantee. Since the product is purchased through other websites, the return policies of those retailers apply. There were a few reviews on the website itself that promoted the product. If you go to Amazon, there were numerous reviews both positive and negative on this product. If you read through them, it seems that if the product was used continually, there were positive results. Most of the negative reviews were because the product wasn’t used long enough. 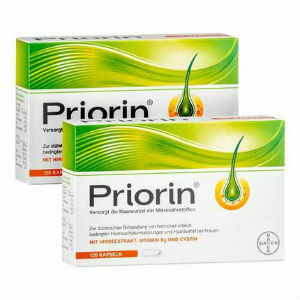 Priorin produced by Bayer Company seems to have the natural ingredients necessary to do as it states and there were numerous positive reviews. There is no guarantee provided by the company that the product will work. I also couldn’t find any indication of side effects. The product is rather expensive and it seems like you won’t know if it works for quite a few months. You will have to invest quite a bit of money to see if the product is even effective for your needs. John Brownstone	reviewed Bayer Priorin	on November 20th	 and gave it a rating of 2.5.